Synopsis: Heroism or cowardice? A stunning story of the First World War from a master storyteller. Told in the voice of a young soldier, the story follows 24 hours in his life at the front during WW1, and captures his memories as he looks back over his life. Full of stunningly researched detail and engrossing atmosphere, the book leads to a dramatic and moving conclusion. Both a love story and a deeply moving account of the horrors of the First World War, this book will reach everyone from 9 to 90. Tommo Peaceful is recounting his childhood, basking in memories of times where every day was an adventure. He remembers his first day of school, his brother Charlie comforting him, the way his father died in the woods, his mother working hard to put food on the table, meeting the only girl in his life, Molly, and loving her, enlisting in the war as a fifteen year old, experiencing the terror of war: the shells, the death, the noise- everything… memories upon memories. Anyone who has done any research into World War One will know just how bloody and tragic the “Great” War was. Private Peaceful attempts to show, on a more personal level, the beauty and sanctity of life and the grim truth of the war. Written in first person, Private Peaceful tackles the harrowing lives of brothers Tommo and Charlie who were teenagers when they left for Belgium. Private Peaceful is one of the few novels that most people I know have read and loved. It was my first encounter with WWI, and at the time I was about ten. I may have been quite young to be reading such an emotionally truthful novel, but I remember being incredibly moved by it. Every time I have read it since, I remember that first time, and every time again I am touched by the innocence and love that Michael Morpurgo creates between the pages. 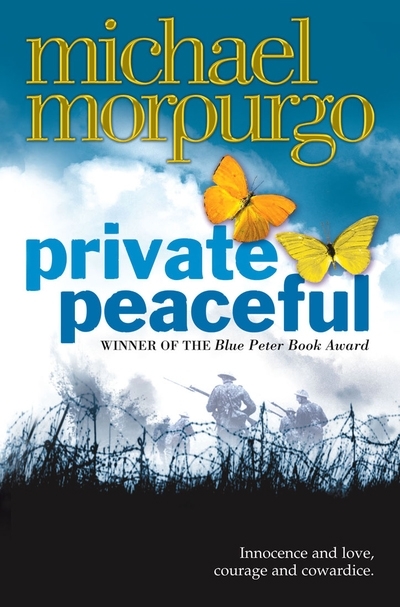 Michael Morpurgo is famed for his fantastic novels for children, but Private Peaceful is, in my opinion, one of his best and appropriate for all ages-whether young or old. This is one of the few books I recommend to anyone who comes to me for reading material. Regardless of taste, the pure humanitarian story will engross you and pull you in. I’m finding it hard to say something about Private Peaceful, but I don’t think I need to say more. This is a book that will move you – more than any book perhaps. You will not be disappointed, just expect to shed some tears. What did you think about Private Peaceful?